Sleep Studies need to be prescribed by a physician and you are encouraged to discuss your Sleep Health with your physician to obtain a Prescription for the Watch-PAT Home Sleep Study. A Prescription Form is provided in the sidebar to assist you in facilitating the study. 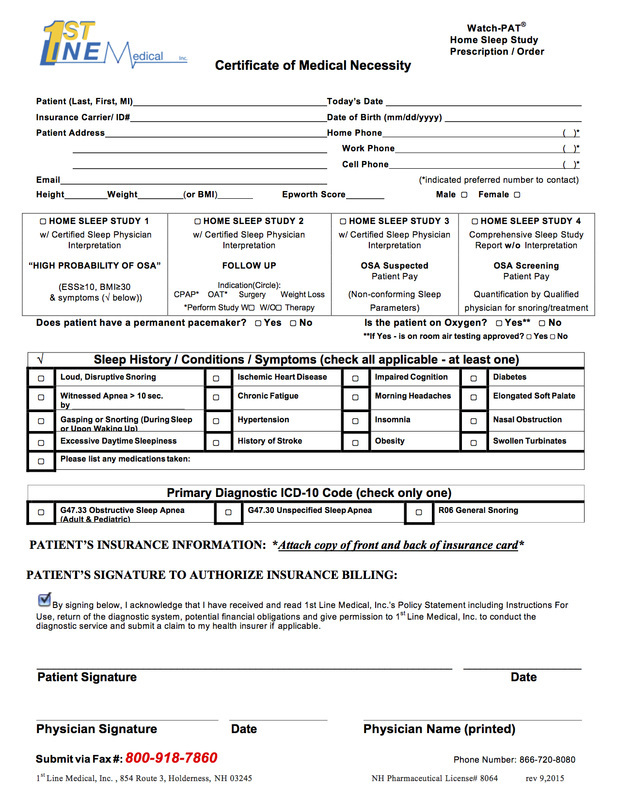 Simply print and ask your physician to authorize the Sleep Study. Fax the form to us and we will contact you to make arrangements. We ship the Watch-PAT to you via UPS and provide a prepaid return label to get it back to us. The Data is then reviewed by a Sleep Physician and the results sent back to the Prescribing physician to review with you. The entire process can be accomplished in 4-5 days, with one night's use of the Watch-PAT at home in the comfort of your own bed. Most Insurers cover Home Sleep Studies and we will gladly confirm your insurer's policy, and if you have a high deductible or no insurance, the Watch-PAT Sleep Study can be completed for only $245.00, saving potentially thousands off the cost of a hospital or lab based overnight Sleep Study. We may be able to submit a claim for the service to your insurer and in the event we can't, we take all major credit cards for your convenience. You may also pay the service fee securely online @ Payment on Account. Upon receiving, using and returning the easy to use system to us, review the results with your prescribing physician to determine the next step.